BikJump ended at 7th place in Geert Maeckelbergh's Country Chess First Divsion of The Netherlands. After a result like this, I feel the well-known "itch" to go back to work on my chess engine again. But first a few more improvements in Chess for Android. In any case, thanks for running the tournament Geert. 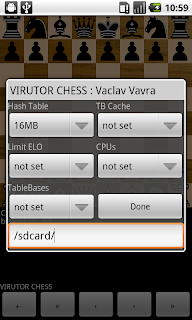 Vaclav Vavra set up a new website for Virutor Chess, an UCI engine available for Windows, ARM-based Android devices (and Linux soon to follow). The Android version imports without any issues in Chess for Android. I also ran a quick tournament between the built-in engine, BikJump, and Virutor. The results are show below. Another engine that can be imported in Chess for Android just became available. Martin Sedlák released a new version of his engine Cheng3, and Jim Ablett kindly made a binary available for ARM-based Android devices. The engine functions well, although it responds with "no GTB found" for the Gaviota endgame tablebases, even thought the cp4 versions reside in /sdcard/gtb. The results of a quick tournament with different engines varying in strength is shown below. Quite impressive! I just released version 3.1.1 of Chess for Android at the Android market and as direct download with the new Setup Position feature. Update: There was a minor bug in defining the halfmove clock of a position, something that is relevant only for positions affected by the fifty move rule. I have posted a fix in version 3.1.2 on my website (or you can wait for the next release through the market). I finished the new Setup Position feature, which I hope to release really soon. 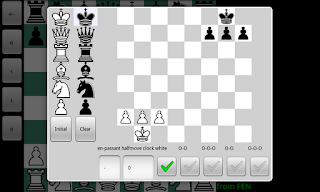 The board editor allows specifying a full FEN position, that is, a board position together with castling rights, the side-to-move, and possibly an en-passant file and halfmove clock counter (for the fifty-move rule). Touching a piece outside the board changes the "pen" to that piece. Alternative, touching a piece on the board changes the "pen" into that piece, and removes the piece from the board (useful to move pieces on the board to another position). The landscape and portrait layouts are shown below. By popular demand, I am working on a Setup Position feature in Chess for Android (file, clipboard, and MIME type operations to import and export games are already supported).This new feature is still in prototype stage, but it is going to look something like shown below. Starting with v3.1, Chess for Android registers itself as a viewer for the application/x-chess-pgn MIME type. This implies that when other Android applications request viewing a game in PGN format, Chess for Android, or any other chess program that supports this type, will open the game.